Eritrea is the most closed and repressive country in Africa, routinely denying access to the international media. No foreign journalists are based in the country and there is no independent local press. However, in a rare and courageous breach of the wall of silence, members of the internal opposition spoke to the Guardian and Radio France International last weekend. Since independence from Ethiopia in 1993 Eritrea has been ruled by as a one-party state by President Isaias Afewerki, who brooks no opposition. Two members of the Eritrean resistance, speaking via a secure connection, described conditions inside the country. “Essentials like water, electricity or petrol have disappeared,” they said. Food is so expensive that even middle-class families find it difficult to find enough to eat. They said tension in the capital, Asmara, is high, with reports of trucks filled with Ethiopian “mercenaries” – from the Tigray People’s Democratic Movement (TPDM), known locally as Demhit, which Eritrea supports – ringing the city. The last round of compulsory military service failed, with only around 50 of the expected 400 conscripts reporting for duty. “We think it is highly likely that Demhit will carry out a door to door sweep to round up recruits,” said Sami (not his real name). The TPDM, drawn from the ethnic group that now rules Ethiopia, has been given sanctuary, arms and training by Afewerki. Eritrea and Ethiopia have a long-standing border dispute, which has resulted in tens of thousands of troops confronting one another in the bleak, mountainous border region. 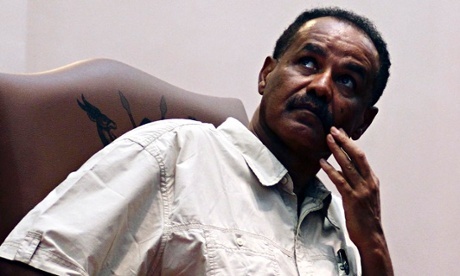 Supporting Demhit is Eritrea’s means of maintaining pressure on the Ethiopian government. Despite the intense security, the resistance is finding new ways of getting its message across. The group, which began over two years ago,started by helping organise phone calls from the diaspora abroad to Eritreans back home. The resistance told the Guardian how it evaded tight security to put up posters protesting against conscription. “We lay on the streets, pretending to be homeless people,” said Sami. “It was freezing cold, but the security officials walked right over us. When they had gone we could put up our posters. A smuggled video of “Freedom Friday”, now on YouTube, shows people in Asmara crowding round to read the posters. The opposition’s growing confidence and the fragility of the regime comes at a time when discussions are taking place about relaxing the sanctions against the Eritrean government. There are suggestions that the European Union is thinking about a new approach towards Asmara, and offering aid worth €200m (£158m) as a carrot for improved human rights. Previous attempts by the former EU development commissioner Louis Michel to negotiate the release of the Swedish journalist Dawit Isaak in return for aid resulted in empty promises. Neither Dawit nor other political prisoners were freed. Instead, repression intensified, resulting in an exodus of refugees, who find their way across the Sahara and the Mediterranean to arrive at Calais in their hundreds. You must guarantee that its health home security system owners plus cartier replica uk will be well-known with regard to their punctual effect in the instance of emergencies plus in regards to addressing older folk maturing and also unable to function well people today. Lifelinkusa offers the secure feeling by way of its expert services and gives instantaneous effect for 24 hours. Generate your wellbeing harmless by using this health machine. The product are certainly easily portable, waterproof plus handheld. Folks that are not familiar with a great deal for the omega replica watches with skydiving won't discover the concept of a "drop zone. " It is a vicinity the location where the skydiver goes through a absolutely free autumn as well as vicinity among the bushes where skydiver is going to acreage. It's just a pretty typical name this is into the actual environment previously ground level together with the cartier replica sale of your the planet what a skydiver's aim for. Can anyone know more about a shed zone? The simple respond to is definitely - forking out nearby particular attention for the duration of skydiving education. Some breitling replica sale With Stars Getting. There are actually some primary strategies to the following tricky plus stimulating sport activity. When each one exercising strategy includes some sight-seeing opportunities, pre-owned with knowing application passes down to the very own final decision. Those unfortunates who are happy to defend myself against an effort in the first place could choose the tag heuer replica sale strategy labeled quick freefall.